The first government of the State of Israel consisted of a 12 member cabinet, headed by Prime Minister David Ben-Gurion, who also served as Minister of Defense. The cabinet consisted of 7 members of the Mapai Party, with one member each representing Mizrachi, Ha-Po’el ha-Mizrachi, Agudat Israel, Progressives, and the Sephardim. Ben-Gurion, Sharatt, Rosen, Kaplan, Remez, Maimon, Shapira, Levin, and Shitrit were members of the provisional government and retained their posts in the first cabinet. The portfolios of Agriculture, Commerce and Industry, and Health were held in reserve with the hope that the Mapam and General Zionist parties would join the coalition government; hence Dov Joseph, Elizer Kaplan, and Moshe Shapira held dual positions. 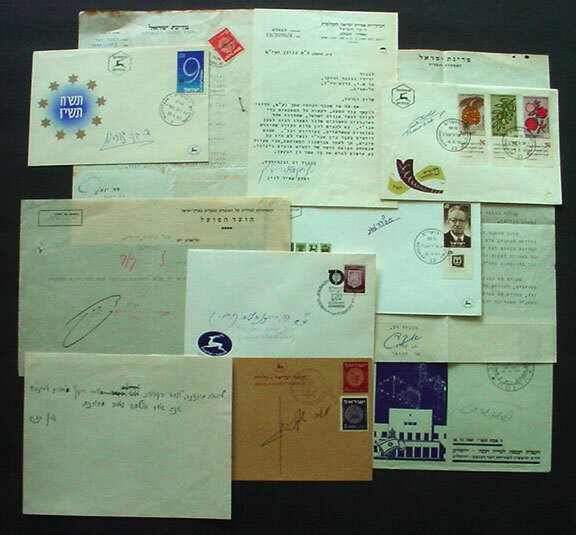 The autographs and letters in this collection are all signed by individuals who served as leaders of the newborn state, pioneers of their generation. Their official acts, their courage and commitment enabled the new Jewish State to embark on its journey of self rule and determination. This collection consists of 11 of the 12 members of the First Government. David Ben Gurion- Prime Minister & Minister of Defense. Israeli First Day signed in Hebrew. Dov Joseph, Minister of Agriculture, TLS signed in Hebrew. Yitzhak Meir Levin, Minister of Social Welfare, Rare TLS dated 1949 signed in Hebrew. 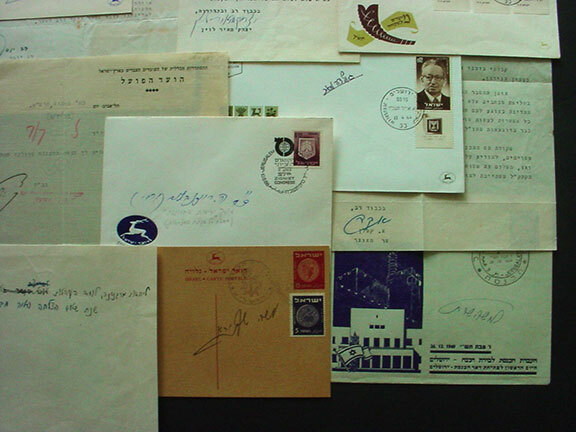 Golda Meir, Minister of Labor & National Insurance, Israeli First Day cover signed in Hebrew. Elizer Kaplan, Minister of Finance & Commerce & Industry, scarce TLS dated 1948, signed in Hebrew. David Remez, Minister of Transportation and Communications. 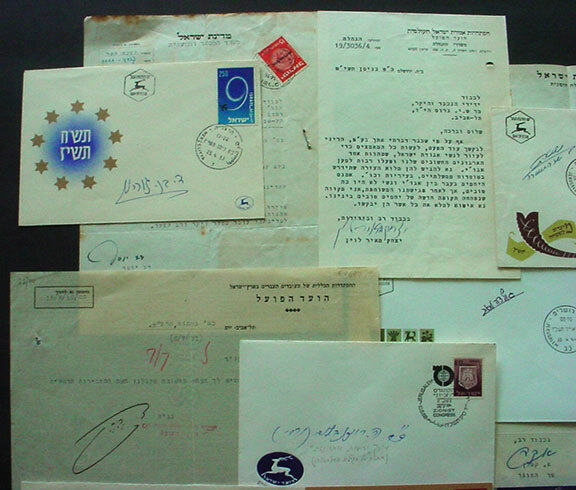 Scarce TLS dated 1931, signed in Hebrew. Pinhas Rosen (Rosenblueth), Minister of Justice. Israeli cover signed in Hebrew. Bhor Shitrit, Minister of Police, Israeli First Day cover signed in Hebrew. Zakman Shazar, Minister of Education and Culture. 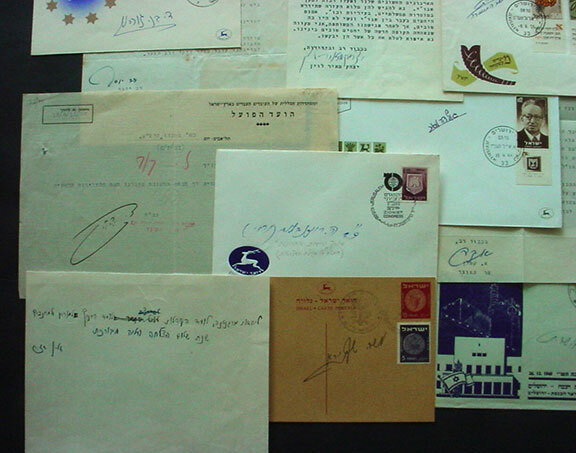 Autograph note signed in Hebrew. Moshe Shapira, Minister of Health, Interior and Immigration. Israeli cover signed in Hebrew.